My interest in firearms is totally related to personal defense. I look at a gun and ask, "Where does this fit into my protection plan?" When selecting a handgun, I look for reliability, worthwhile features and personal fit. It's the same way that the late Jeff Cooper explained it; the gun must be reliable, have high-visibility sights, a good trigger and I add how well it fits me. If it doesn't, can it be made to fit? Price can be a concern, but it is not the only concern if a particular gun meets my needs. Police agencies worldwide have a similar process when selecting a gun for issue. They want reliability, which is directly related to quality, though quality usually results in a higher price. They are also interested in how well it will fit the wide range of hand sizes that makes up their agency, and they also question if the gun will be easy to repair or require the services of a gunsmith. When the Norwegian Police Services wanted a new issue handgun to replace its Smith & Wesson Model 10 revolvers, these were the specifications it wanted to meet. In the end the department selected Heckler and Koch's P-30 as the gun that best fit its needs, but it wanted a version with a longer barrel for the uniformed service that would not be concealing it. HK met this demand with its new model, the HK P-30L, which stands for Long Slide. The new P-30L is one of the most modern police pistols to come along in quite awhile. During its development, the designers felt the most important requirements were flexibility, functionality and as much safety as could be incorporated into a weapon. Ergonomics of the grip are probably the best on the market, as the backstrap inserts and lateral plates for the sides are interchangeable. 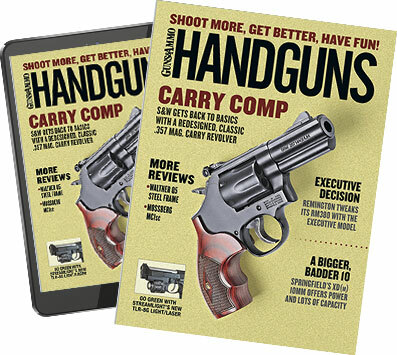 This means the entire 360-degree surface of the grip can be adapted to fit a shooter's hand, as can the ambidextrous slide and magazine release levers. The P-30L can literally be "built" to fit the hand of most any shooter. The P-30L has a self-decocking, double-action hammer with a firing pin block that eliminates the need for a manual, exterior-mounted safety lever. Another worthwhile feature is the open square-notch, slant-back rear sight with Luminova dots, which assist fast and accurate target acquisition even under poor lighting conditions. These sights are drift adjustable and are quite robust. The double/single-action pistol incorporates a long first pull with subsequent short strokes. Many shooters view the first long trigger pull as a safety against involuntary discharge. In my experience, the double-action pull of HK triggers is usually heavy, and I suspect it is due to HK pistols being used around the world where the quality of ammo is suspect at best. The hammer fall on an HK is likely to dent even the hardest of primers, so if the gun is used somewhere in Africa it will probably work. Here in the U.S., ammo quality is excellent and the long, hard double-action trigger is unnecessary. I have always changed the stock hammer spring for one from Wolff Springs, and if I were to carry the P-30L this is what I would do. Regardless of ammo style, the HK P-30L was more than accurate enough for combat. The P-30L is as ambidextrous as any handgun can be. In addition to the modular grip, the magazine and slide lock levers are located on both sides. I do not usually like the magazine release lever on HK pistols, as it requires a downward push in order to eject the magazine. I have small hands and it does not matter if I use my thumb or trigger finger, I cannot release the magazine without some shifting in my hand. Fortunately, the new L-shaped lever on the P-30L can be pressed to the rear, which will release the magazine. For testing, I pulled together all of the 9mm ammo that I could, including various hollowpoints from Winchester, Cor-Bon, Federal, Black Hills, Remington, Hornady and even some old Trition Quick Shock ammo. The decocking lever on the P-30L is on the rear of the slide, out of the way of the shooting hand. I also found some old 9mm reloads that had been in my attic for years--some of the cases were actually green--but I decided that I would see if the HK would handle it. Accuracy testing was conducted at 25 yards from a Hornady Delta Rest; results are shown in the accompanying chart. As far as reliability goes, it's an HK--what more need I say? The pistol ran without a hiccup, though I shot all the aforementioned questionable ammo through it. I ran it one-handed, two-handed and upside down. Performance was flawless. Ergonomics were actually not that different from the standard P-30, other than taking slightly more lift to clear the holster when drawing. Controllability was excellent, with just a bit more of a weight-forward feel than the shorter P-30. It would even work for concealed carry, though the standard P-30 is a smarter choice for that application. The long slide P-30L will make a very formidable arm for any law enforcement agency, officer or legally armed citizen. In a world of compromise, choosing to carry a pistol from HK compromises nothing.